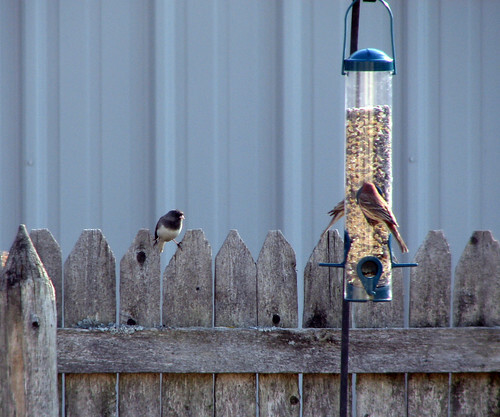 My first thought was that the Junco was amazed to see how other birds actually eat right there on the feeder. What a concept! Check out how he’s straddling two fence posts just to keep upright in what must be an extreme state of shock – too cute! A Peregrine Falcon named Esteban Colbert, after Stephen Colbert’s alter-ego Esteban Colberto, has taken up residence at the San Jose City Hall. Colbert (the falcon) has been seen with Clara, a Peregrine who has starred in the City Hall’s Falcon Cam for the last two years. The San Jose City Hall Peregrine Falcons became reality show superstars more than two years ago when staff opened up the birds’ rooftop nesting box to worldwide viewers of the FalconCam. In the third “season” of her ongoing reality show, falcon mother Clara has another new man in her life and, based on field reports, is expected to soon make him a father. Clara has quite a history with the males. As it became apparent that last year’s tiercel (male falcon) Carlos was not returning for a second season, falcon fans have been watching the FalconCam to see if a new beau would attempt to woo Clara. Read the whole article here and find out more about the San Jose Falcons here. This clip of Conan O’Brien birdwatching in Central Park with a group of birders aired earlier this week. The actual birding took place in the spring of 2005. I’m not a huge Conan fan but I laughed during this segment. I think he’s a bit more respectful than Steve Carell was when he joined some birders during the WSOB. 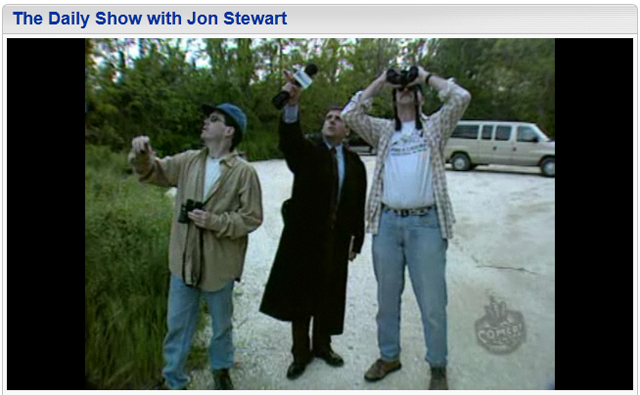 I just came across this old clip from the Daily Show about the World Series of Birding. The 2009 WSOB will be the 26th edition and will take place on May. Here’s the Daily Show’s take on an earlier WSOB, with correspondent Steve Carell. Update March 2012: This video may no longer be embeddable. Click on the screen-shot below to view the video on the Daily Show website. Check out this post over at Urban Hawks. Think this trick would make the Ibis popular at parties? Favorite line: It’s alright if you act like a turd, ‘cuz I like birds.